Daria stands along Aeon Flux, Clone High and parent series Beavis and Butthead as MTV's most enduring contributions to animation and pop culture. It also perfectly captured the alienation of high school better than almost any show, animated or otherwise, with the exception of Buffy the Vampire Slayer. For five seasons, and two TV movies, sarcastic teen Daria Morgendorffer and sardonic bestie Jane Lane endured the vapid inanity of fictional town Lawndale, including the students and faculty of Lawndale High. The show tackled the typical high school tropes—self-esteem, losing your virginity, eating disorders, college anxiety, friend drama—with biting satire, bone-dry wit, and an intelligence that belied its animated roots. 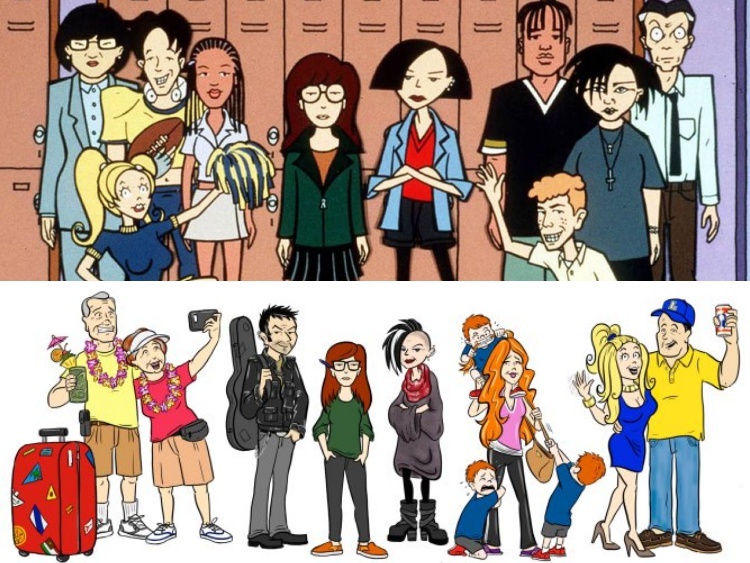 Daria celebrated its 20th anniversary back in March and Entertainment Weekly got series co-creator Susan Lewis and character designer Karen Disher to reimagine how some of the characters have changed over the years. Retirement has apparently calmed Helen Morgendorffer—no longer the power skirtsuit-wearing, ball-busting corporate lawyer of Daria's youth—while Jake finally was able to give up the ghost of his consulting business and just relax and get high, which is all the former high-strung hippie ever wanted to do anyway. Honestly, I figured Quinn would be a Real Housewife™ by now with her own line of box wine, vigorously working through her third divorce, but Daria always had a way of grounding its characters in reality—a reality littered with disappointments and dreams deferred. Quinn's hair, however, is still "too cute." So much for Jane's mild sapphic flirtation in the TV movie Is It College Yet? leading to a full-blown lezzing out, but glad to see Jane followed her artistic aspirations. For the record, so did her brother Trent, though Mystik Spiral is sadly no more. #RIP. As for Daria, she's basically Liz Lemon—writing jokes with a bunch of man-child bros she probably spends most of her time babysitting. Blerg. Though I can't see Daria churning out a Dealbreakers-type self-help book, it feels right that she's living in the third gayest neighborhood in the country. Mr. DeMartino is probably dead, that pulsating eyeball finally bursting during Kevin's second lap around senior year. Constantly embattled principal Angela Li had to eventually land in jail for, I dunno, sneaking HGH into the football team's water supply for dollars/kicks. Charles "Upchuck" Ruttheimer III recently got fired from his comfy tech job at Uber for sexual harassment. Sandi, Stacy and Tiffany—collectively known as The Fashion Club—all peaked in high school and out of disappointment with life, formed a gang of stylish bank robbers, which in turned inspired a Lifetime movie. Exceptional Token Black Girl Jodie Landon scored a fabulous gig working for the post-White House Obamas. EW's nostalgia game has been strong as of late, recently reuniting another show that got many a queer kid through middle and high school, Buffy the Vampire Slayer. While I'm tentatively against a Buffy reboot, I'll co-sign a Daria reboot right now. Even better, co-creator Susan Lewis tells EW she's on board so let's get this happening because, obviously, there aren't nearly enough '90s TV reboots.